Schools are full of plain and tired walls and surfaces that could easily be brought to life using inspiring Wall Art. 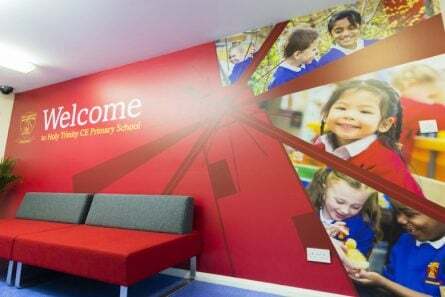 Below are ten tips for using bespoke wall art to the best effect in your school. Wall Art on your schools exterior walls and fencing gives a window into life at your school and makes your school an inviting place to visit. First impressions and the way you present yourselves counts. Well designed Wall Art in your reception area can make that all important first impression a good one. A friendly and welcoming reception area will make your visitors feel comfortable and at ease and more likely to be keen to come back in the future. 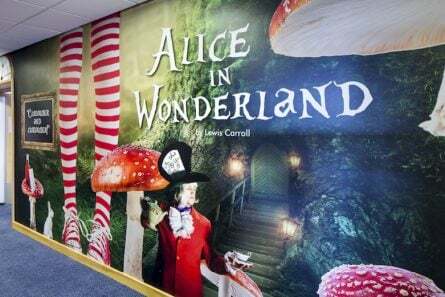 Impactful Wall Art with interesting and age appropriate content will encourage children’s natural curiosity and inspire pupils and staff a like. Wall Art can be effectively used to raise pupil’s ambitions through carefully chosen, aspirational wording and images. Bespoke artwork that showcases curriculum information can act as visual resources to support your pupils’ learning and encourage engagement in subject knowledge, for example, using timelines of historical events can reinforce class based learning and open pupils’ eyes to the impact of key figures and events in history. 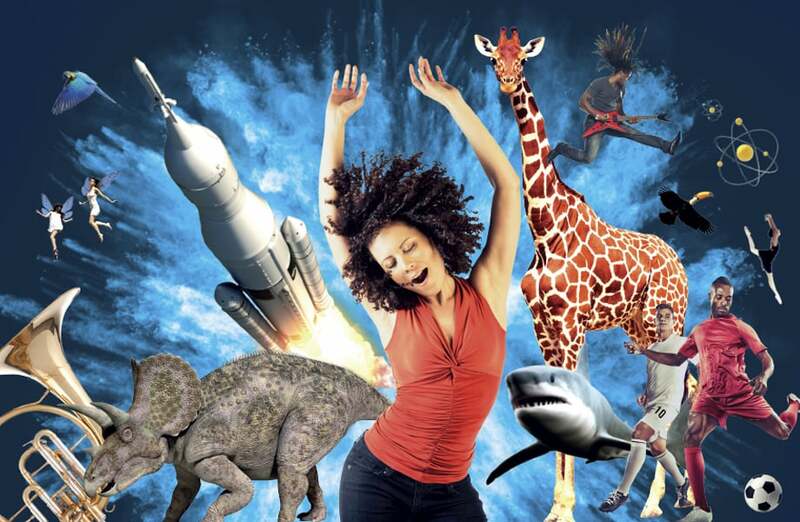 Themed areas representing various environments can widen children’s understanding of the world around them. Inspiring Wall Art can stimulate curiosity and interest in the subject matter being depicted. Themed and curriculum based areas can encourage investigation and deeper thinking as well as spark imaginations. Stimulating wall graphics can be used to initiate conversation and discussion between groups of pupils and with their teachers. Using Wall Art to zone areas, for example, a computing themed corridor leading to the computing department/suite is a great way to assist pupils to find where they need to go and it also helps to get them into the right frame of mind for a subject as they wait to go into lessons. Including way-finding information designed into the graphics can further support pupils and visitors to quickly and efficiently get where they need to be. Celebrate your school and everything that you stand for through visual boards that communicate your values and vision. Values based Wall Art is a great way to illustrate the meaning of your vision to your pupils and raise the profile of how you aim to help children to learn, grow and develop. Maintenance of your walls and creating displays can be both time consuming for teachers and use more of your school’s budget than you may first think. 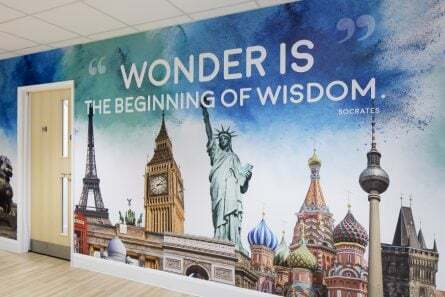 Professional, bespoke wall graphics last many years, therefore, reducing maintenance costs as well as giving more time back to teachers, allowing them to focus on what they do best. Branded Wall Art is more than just your logo. Branded Wall Art tells the world outside of your school who you are and what you stand for. In addition, it creates a sense of unity and belonging and can motivate staff, children and parents towards a shared goal. In school we are always looking to create awe and wonder moments for the children. A well designed Wall Art can add wow factor to your walls. Wow factor like this can separate you out from the rest. A stimulating feature wall can help to make school feel like a fun and positive place to be and cheer up any drab and dreary area. Most of all it can just make pupils and staff feel happy to be in school. Using your walls effectively is an important way to communicate your school’s message to your pupils, staff, parents and other stakeholders. The value of a school’s walls is often underestimated and is an improvement area that shouldn’t be overlooked. Bring your schools walls to life by calling us today for a no obligation quote on 020 7404 3400 or email lisa.savage@promoteyourschool.co.uk. Enhancing your learning environment can have a huge impact on both pupils and staff in terms of wellbeing, enthusiasm and cutting workload. Finding the space in your budget for this is not always east so here are 5 tips for find other funding options, outside of your school budget, to generate additional money for projects like Wall Art. Is your school visually appealing for your pupils? When they close their eyes and imagine their school will it be a breathtaking, ‘happy place’ with wow factor or will their mental images be of plain, bland walls? With school open days just weeks away parental engagement is never more key. Creating a school environment that is welcoming as well as engaging and impactful can be easier than you think.